The MMD in Western Province has disclosed that the Provincial Committee will field in six members to contest different National Executive Committee (NEC) positions during the MMD convention which is scheduled to take from the 5th -7th April 2011 in Kabwe. Provincial Chairman Simasiku Namakando said the Provincial Committee is busy campaigning for the six candidates from Western Province because there are committed and hardworking members whom once elected will help enhance development in the party and country as a whole. He named the six candidates as Michael Mabenga who be defending his position as MMD National Chairman, Michael Kaingu as National Treasurer and Geoffrey Lungwagwa as chairman for Education. Others are Situmbuko Musokotwane as chairman for Finance, Austin Liato as Chairman for Labour and Sikwibele Mwapela as National trustee. Meanwhile, Mr. Namakando said the party in the province is very strong on the grass roots and will rally behind President Rupiah Banda during elections. He said that despite the confusions that took place in Mongu last month the party is still very popular and is ready for this year’s general elections. 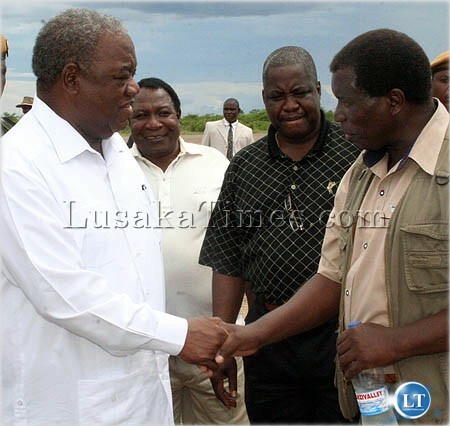 Namakando further said the people of Western Province are happy with the developments brought forth by President Rupiah Banda and his Government. It was at Banda’s behest that two lives were lost kwahae recently. This is what Panji had to say, MMD is doomed there: – “Human life has been lost. Some of our leaders are saying they are reverends; they go and preach on Sundays: ‘thy shall not kill’ and now the government through their agency have killed a person without explaining to the family how that person died. This evening when our leaders go to bed, Shikapwasha, Dora Siliya even the President, they will hug their children, their spouses will prepare dinner and eat and rejoice. But somewhere in Mongu tonight there will be an empty bed, at the dining table there will be an empty seat. Those people that were killed will never come back,” Col Panji said. why are they fielding 6..isn’t this tribal..they should just let those that are credible take up..no Mr.CDF again..he has failed to lead ..HH will make a big day in WP..
Let mmd pretend that they have support in western province but come what may mmd will dance to the tune in western province this year. Those thinking mmd has support there wake up before you are shocked this year. people are no longer sleepy there and they will never be taken for granted by cheap mmd promises. Hey Bo Namakando dream on dear. Do not underrate LOZIS. Namakando and his list of 6 intending to contest for NEC positions does dont reflect the mood of the pipo in Western Province.Its the likes of Namakando who are giving wrong statements. How can those guys be voted into NEC for what coz when it mattered pipo being arrested and killed by the police non of them ever stood to their defence. RB has lost it in Western Province. Chapwa. WHY? Because the senior cadre in the name of William Banda has his own list. [-( I wonder what some people are still looking for in politics.It is very easy to please someone that the MMD is still popular in the Western Province.The blood that was poured out of the two lives is still groaning.People should not be cheated.This is a mere propaganda.What we hearing are only the last kicks of a dying horse…. and i wonder what will happen if all the Lozi candidates lose..! You have got to have your head examined if you dream about MMD getting anything from WP. Gus you shu know barostland properly.Kaoma will still be MMD.Lukulu this time they will vote for MMD.Sehseke will vote for MMd.Shangombo will be MMD.The only districts which are trick for MMD is Mongu, Senenga and Kalabo.Kalabo is the centre of Barotse Royal Establishment.Which ever way the BRE will go definatley that party will get it in Kalabo.So Mongu is difficult.